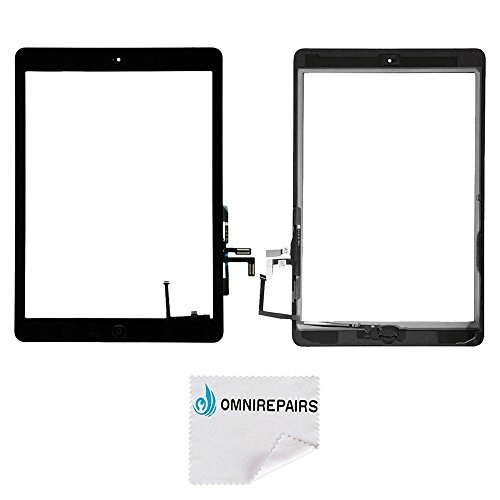 Omnirepairs-For Black iPad Air (iPad 5) 1st Generation Glass Touch Screen Digitizer Assembly Replacement with Home Button Flex, Rubber Gasket, Camera Bracket and Pre-installed Adhesive Tape | Replicafer Co. Acknowledgement of the following DISCLAIMER is required before making a purchase: OmniRepairs. and its products are by no means affiliated with, Apple, HTC, Motorola, Samsung, Verizon, AT&T, T-mobile, Sprint or any of their subsidiaries. Our parts are NOT refurbished or guaranteed by any of the above companies, and are the property of their owners. We will not be held responsible for any misuses or misrepresentations of our products conducted by buyers. Includes x1 Black Digitizer Touch Screen Assembly Replacement, Pre-installed Adhesive and Pre-installed Home Button.